Schools and colleges are being warned to expect “more variation” in AS-level results in England this year, the first since they were split from A-levels. Results in the 13 decoupled subjects have been “relatively stable in recent years”, says exams regulator, Ofqual. But this year “we expect that there will be more variability than between 2015 and 2016”, warns the report. Students and teachers are “getting to grips” with the new system, says Ofqual associate director, Cath Jadhav. “We know that students tend to do less well in the first year of a new qualification,” writes Ms Jadhav, in a blog. AS-levels have been split from A-levels since last September and no longer count towards the final A-level grade. Ms Jadhav says there could also be changes in the ability range of students taking AS-levels this year which would also affect overall results. Ofqual has noted that the number of entries for AS-levels has fallen by 20% on 2015 in subjects where the grade will no longer count towards the final A-level. It is possible that for some students this exam could be their final school qualification, explained Malcolm Trobe, interim general secretary of the Association of School and College Leaders. Some schools may have decided that students who are aiming for A-levels should skip AS-levels altogether, said Mr Trobe. In her blog, Ms Jadhav says the regulator will rely on statistical predictions to ensure students are not disadvantaged by being the first cohort to sit the new linear AS qualifications. 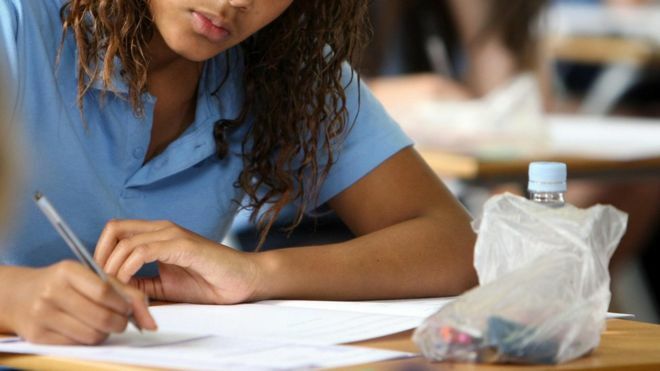 She warns that exam boards “won’t be slaves to the predictions” when they set grade boundaries. But “exam boards will need to be able to justify any grade boundaries that are different from those suggested by the predictions”, she adds. “We would expect to see some variability,” said Mr Trobe. “What is important is that there will be appropriate checks and balances in place so that young people are not disadvantaged in any way. Ofqual plans to publish its 2016 AS-level analysis when the results come out on August 18.